Eco Products Maui is proud to offer a complete line of reliable domestic, agricultural and fire pump systems. For over 20 years we have supplied water pumps in countless on and off grid locations on Maui. We offer both the deserving famous Grundfos and Meyer Water pumps. The simple design and solid construction of these “end suction” pumps from Grundfos (and Meyer) is widely respected for reliable service ease of maintenance and tolerance of abuse. Pump Packages are available in single and dual pump systems. We offer and maintain top brands and sizes of pumps and types of controllers. Why use a Dual Pump System? After many years of dealing with water supply interruptions due to various pump component system failures I now recommend one of several options of dual pump systems offering long term “peace of mind”, more energy efficiency, larger volume capacity and smooth even performance. I often get a calls, usually first thing Monday morning from a customer who is “out of water” due to some component failing in his water supply system. Though we supply the best quality components available often it is the pressure tank or the controller but it can be the pump or the check valve. Several times the owner has been off island and the tenants are calling him and he is calling for help from Bali or Europe. 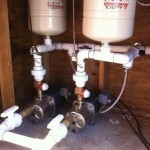 The dual pump system is a simple, low cost and effective solution to long term reliability and water supply security. The dual csv type system offer greater electrical efficiency with double capacity available as needed for fire sprinklers and other purposes. Reliability. With redundant components we are ready for something to fail in one of the systems. Efficiency. With one single pump is sufficient most of the time much less power is needed. Capacity. 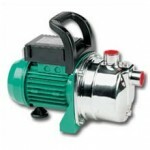 Double the capacity of the master pump is available automatically as needed. Smooth VSD type performance from minimum to the maximum output of both pumps. For more information see our Introduction to Dual Pump Systems. We offer four complete dual pump packages to suit a wide range of domestic, fire and agricultural demands. We offer three basic Grundfos pump packages with smooth operating CSV pressure controllers. We also offer and maintain other top brands and sizes of pumps and types of controllers.